This third volume in a series devoted to luminaries in the history of psychology--features chapter authors who are themselves highly visible and eminent scholars. They provide glimpses of the giants who shaped modern cognitive and behavioral science, and shed new light on their contributions and personalities, often with a touch of humor or whimsy and with fresh personal insights. The animated style, carefully selected details, and lively perspective make the people, ideas, and controversies in the history of psychology come alive. The fields touched on in this and other volumes cover all of the subfields of psychology. 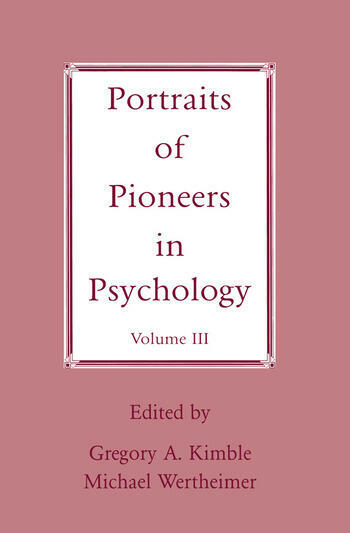 As such, all volumes of Portraits of Pioneers in Psychology will be of interest to psychologists, as well as scholars in related fields. The resourceful teacher could use a selection of chapters as supplementary readings to enhance almost any course in the discipline. The major purpose of these books is to provide source materials for students and their teachers in undergraduate and graduate courses in the history of psychology. Each of the five volumes in this series contains different profiles thereby bringing more than 100 of the pioneers in psychology more vividly to life. Contents: Preface. Portraits of the Editors and Authors. J.K. Bare, Laurens Perseus Hickok: Philosopher, Theologian, and Psychologist. R.B. Masterton, Charles Darwin: Father of Evolutionary Psychology. A.L. Blumenthal, Leipzig, Wilhelm Wundt, and Psychology's Gilded Age. C.A. Boneau, Hermann Ebbinghaus: On the Road to Progress or Down the Garden Path? R.E. Fancher, Alfred Binet, General Psychologist. L.V. Jones, L.L. Thurstone's Vision of Psychology as a Quantitative Rational Science. M.A. Lewin, Kurt Lewin: His Psychology and a Daughter's Recollections. D. Katz, B.T. Johnson, D.R. Nichols, Floyd Henry Allport: Founder of Social Psychology as a Behavioral Science. E. Zigler, E. Gilman, The Legacy of Jean Piaget. D.B. King, M. Cox, M. Wertheimer, Karl Duncker: Productive Problems With Beautiful Solutions. H. Schiffman, Milton Erickson: Scientist, Hypnotist, Healer. G. Gottlieb, Zing-Yang Kuo: Radical Scientific Philosopher and Innovative Experimentalist. T.C. Dalton, V.W. Bergenn, Myrtle McGraw: Pioneer in Neurobehavioral Development. D.A. Dewsbury, Henry W. Nissen: Quiet Comparative Psychologist. M. Lakin, Carl Rogers and the Culture of Psychotherapy. D.W. Bjork, Burrhus Frederick Skinner: The Contingencies of a Life. G.A. Kimble, Kenneth W. Spence: Theorist With an Empiricist Conscience. N.K. Innis, David Krech: Scientist and Social Activist. J.S. Freund, Benton J. Underwood: A Tribute of Memories. J.W. Brehm, Leon Festinger: Beyond the Obvious. Index.